The Way We Were: "Christmas Past"
This program reviewed the long history of Jewish families who settled in New Mexico. It detailed the historic forces and events that brought them here from Europe and the Middle East over several centuries of tolerance, or, of persecution. Jewish history in America has roots in Spain, Germany, Russia, Eastern Europe, and the Middle East. In the 1800s, several branches of Judaism across Europe sought safety and freedom in a series of migrations that continued the Great Diaspora, ultimately bringing two and a half million Jews to the New World. Immigrants in the 1800s first arrived on the east coast, mostly at New York, where their work ethic and skills in business and trade were a plus in a crowded market. However, the West offered the widest range of opportunities for new immigrants and later, for family members to follow. Several families immigrating to New Mexico in the 19th & early 20th centuries became household names, such as the Ilfelds, Spiegelbergs, and Jaffas, and in this area, the Solomon Bibo family. Coming from Prussia at age 16, Bibo over time developed trade with the Lagunas and Acomas, among others. He later married Juana Valle of Acoma, becoming a governor of that Pueblo four times. He worked principally as a go-between, serving the pueblo and the US Army to resolve border disputes. Such first-generation Jewish families in New Mexico and southern Colorado were very successful in business, mercantile, and skilled trades. However, within a few generations these fields had declined, to be replaced by a strong Jewish presence in professional, technical, and legal fields. Their names live on, on imposing commercial buildings across the region. "Completion! 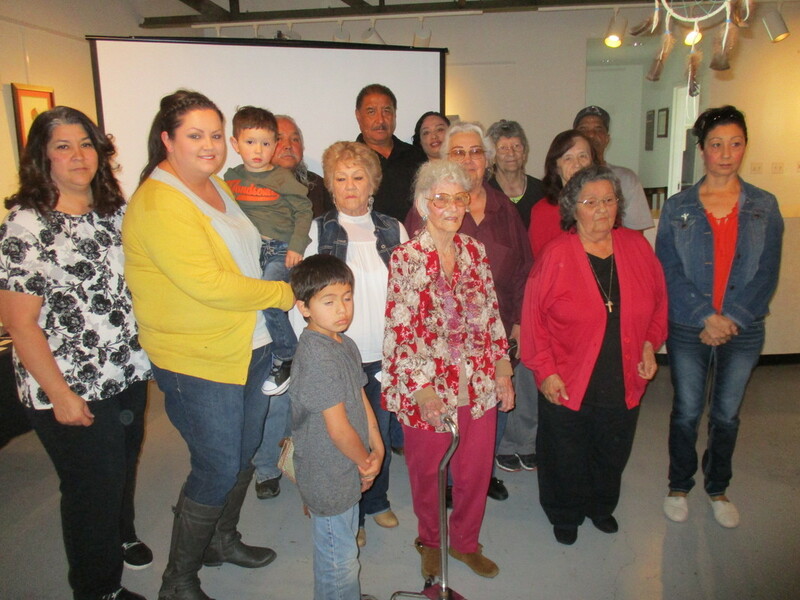 The Western NM Airway Heritage Museum"
"Wings Across The Divide - 90 Years"
Our Spring 2017 quarterly program was The Basques of Cibola County, as presented by Denise Carrica Sanchez and Anna Marie Moleres Lopez. Attendance for the event was about 75 persons, most of whom were from Basque families of this region whose history dates back a century or more. The speakers provided a detailed handout which listed the many Basque families of this area, and described the background on life and concerns in The Old Country, as opposed to the opportunities in The New World. One key topic was the economic and political factors that led more and more of the Basques to migrate from the French-Spanish Pyrenees region to the western United States early in the 20th Century. Another narrative was how, over time, despite language and other issues, they became successful stockmen and businessmen in a foreign land. 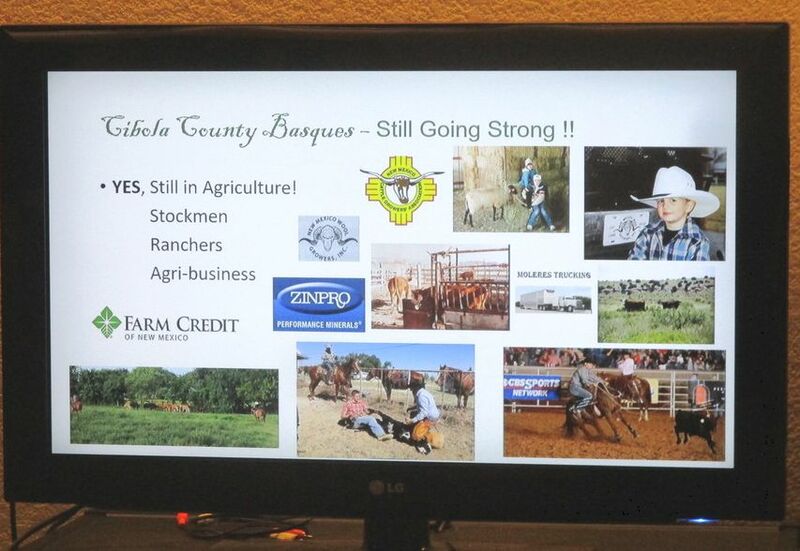 The two presenters spoke by turns about 15 to 20 of the key Basque families and their early sheep herding and later cattle ranching, and other businesses. A detailed PowerPoint program illustrated the challenges and successes that enabled the immigrant Basque families to survive and to prosper. The presentation was followed by a lively (and often humorous) discussion session among many of the local families attending the event. "Little-known facts about great contributions made by early-day immigrants"
Mary Ann Montoya described the global spread of Spanish culture in the 1500s. Explorers and priests colonized both Central America and the Philippine Islands, sending the treasures and goods of both regions eastward to Spain. The U.S. defeated Spanish colonial forces in both regions in 1898, acquiring the Philippines as a trust territory. When workers were needed to harvest US crops in the 1920s-40s, many Filipino men, classed as American nationals, migrated to western and central areas. Mostly Spanish-speaking Catholics, they blended well with other migrant groups "like ghosts," especially in the Southwest. Montoya's father came at 21 to the U.S., and had many jobs in many areas before settling in New Mexico, at San Rafael. He is the only Filipino buried in the San Rafael cemetery. The Filipino heritage continues in this region as a number of area schoolteachers have roots in the Philippines. 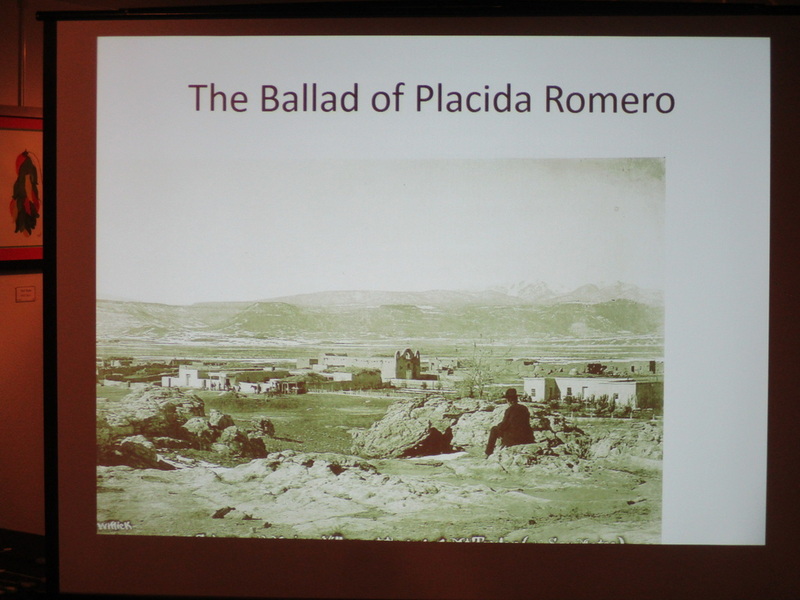 For the Nov 12th quarterly public history meeting, regional historian Bob Roland presented details of his research into early area history, as "The Ballad of Placida Romero." This is the story of a young nueva mexicana woman who, in 1881, was captured by Apache raiders under Chief Nana. Their ambush on her family's rancho in Cebolla Canyon, 30 miles southeast of Grants, killed her husband, and her infant daughter was soon abandoned as the raiders retreated into Mexico. There, Placida was enslaved, cruelly treated, and impregnated. Aided by sympathetic Apache women, she escaped to Ysleta, on the Rio Grande in Texas, and eventually returned here to the village of Cubero. Her remarkable odyssey was written and put to music as a Spanish corrido. Mr. Roland took up this topic nearly 50 years ago, inspired by stories told by Arty Bibo, a fellow rancher in the sandstone bluffs area near La Ventana Arch. This story has appeared as a monograph, and will be published as a book in the near future. Dr. Melzer noted that New Mexico historically ranks 5th in the nation for number (and variety) of these facilities. By the late 19th Century, outhouses could even be bought from the Sears Roebuck catalog. The wooden style was common, but so were brick or adobe. Outhouses had (have) several advantages as well, including sanitation in the home, simplicity, privacy - and solitude! A few negatives included insects, snakes and Halloween vandals. Outhouses have occasionally played a role in the dramas of history, as well. In modern times they have been a vital resource for archaeologists, who have recorded a wide variety of artifacts from the abandoned pits - from medicine or liquor bottles to pipes to watches, coins, rings, and even firearms. A wide variety of outhouse styles made up the majority of the slideshow, including those with multiple seats or even two levels. Many of Melzer's historic images were familiar to the audience, from their own diverse pasts. Nesrly everyone had a comment or anecdote to share with the group. 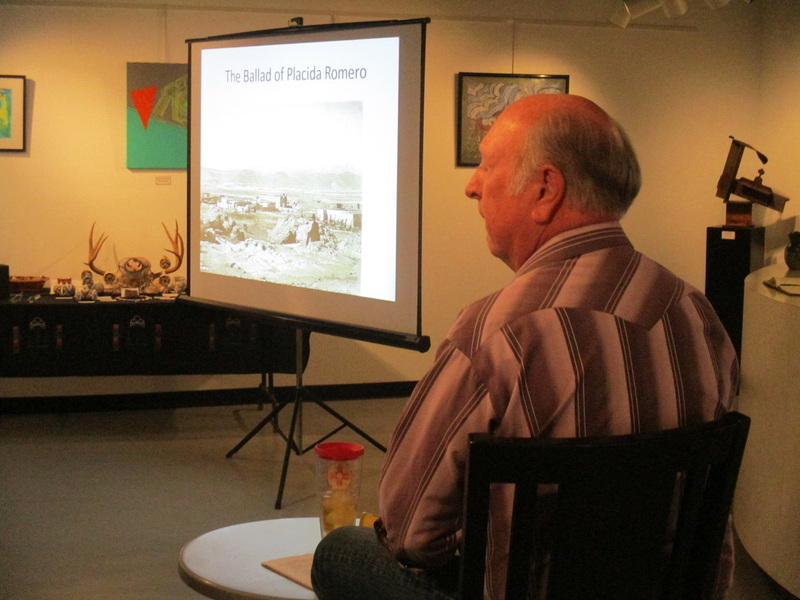 The CCHS Spring Public Program was held on May 14th: "THE CARROT ECONOMY OF CIBOLA COUNTY"
*For the CCHS Spring Quarterly public meeting on May 14th, Historian Paul Milan gave a very interesting talk to more than 25 members and visitors. 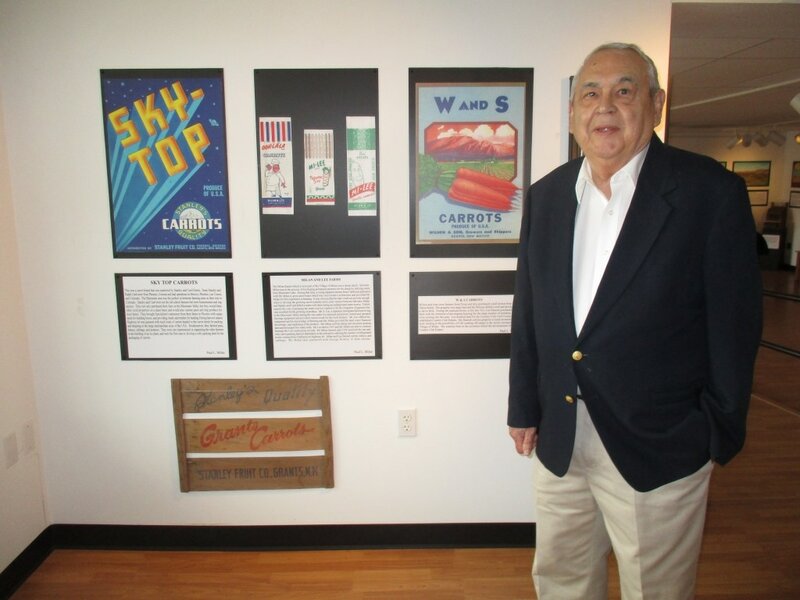 The Milan family was heavily involved in this area's famous fresh carrots agribusiness, a key part of the local economy from the 1920's into the early 1950's. Paul emphasized that his family had been able to acquire surplus railroad lands in the early 1900's as well as the vital water rights that went with the land. Much of this acreage was northwest of the Milan townsite along the valley of Bluewater Creek. He discussed the efforts over the years to control the Creek's floods, including a series of dams, and many wells to tap the groundwaters. In good years, up to 5,000 acres might be farmed. The Milan family were among the larger landowners, and during the summers, Paul himself worked extensively in the fields, in the packing sheds, and along the ditches. As a family member, he supervised the various crews of itinerant workers, be it for carrots, lettuce, onions and more. He said that he "almost" became proficient in Navajo, but he also worked with crews of Filipinos, Japanese, and Mexican workers. Paul described how certain groups were specialists in planting and harvesting different crops, and how they traveled from area to area as the climate determined the harvest cycle - California, Arizona, New Mexico, Texas and more. The famous Grants carrots were most rewarding, but each of the other crops also had their cycles of good or bad years. The Grants and Milan areas prospered from the agricultural work and the infrastructure that grew over time - packing sheds, water wells, ditch systems, an ice plant, a box factory, and crew lodgings - such as the Milan family motel, which still stands. Paul noted that one year the region might ship 35 carloads of carrots - and then ship 97 the next year. The local-area payroll approached $1 million in good years. The large carrots with lush green leaves were highly prized in markets across the country, and were shipped in crates with colorful labels. There were good and bad years, and other factors that impacted the area's farming, such as the growth of mining jobs in the 50's. Even a bumper crop of pinon nuts could lure workers from the fields to pick and sell that crop. Inevitably, the public tastes changed in the late 1950's as plastic-wrapped carrots, without their leafy tops, became more popular. The last crop of carrots was shipped in 1961. Today, just a few farm buildings remain, such as the Quonset hut on Airport Road in Milan. 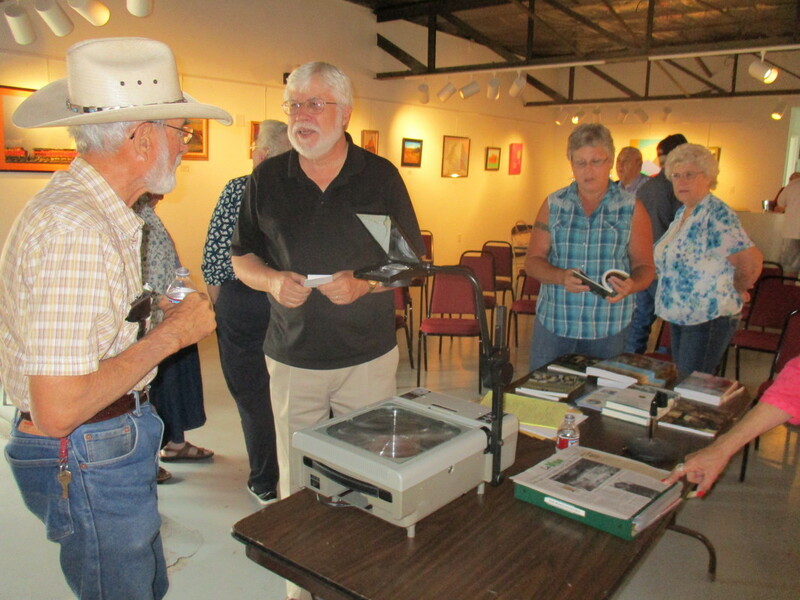 "Grants History: A Day At The Movies"
​The first 2016 CCHS public historical meeting took place at NMSU-Grants, as Paul Milan led those on hand down Memory Lane into the 1940s and 50s - and beyond. One main attraction was a film produced by Grants State Bank to celebrate its fiftieth anniversary. From the bank's founding in 1947, fifty years of community growth, decline, and re-growth were shown. Milestone events of Grants-area history included the rise of industries such as logging, the railroads, fluorspar mining, ranching, agriculture (carrots and more) and the 1950's uranium boom. Several other families with a long history in the area also provided a variety of their 'home movies' that included rodeos, parades and trail rides, as well as "the big snow of 1931" and other long-remembered events. *These quarterly CCHS meetings cover a wide variety of regional topics and both members and the public are welcome.